I’ve been dying to shares today’s project and it is finally done! 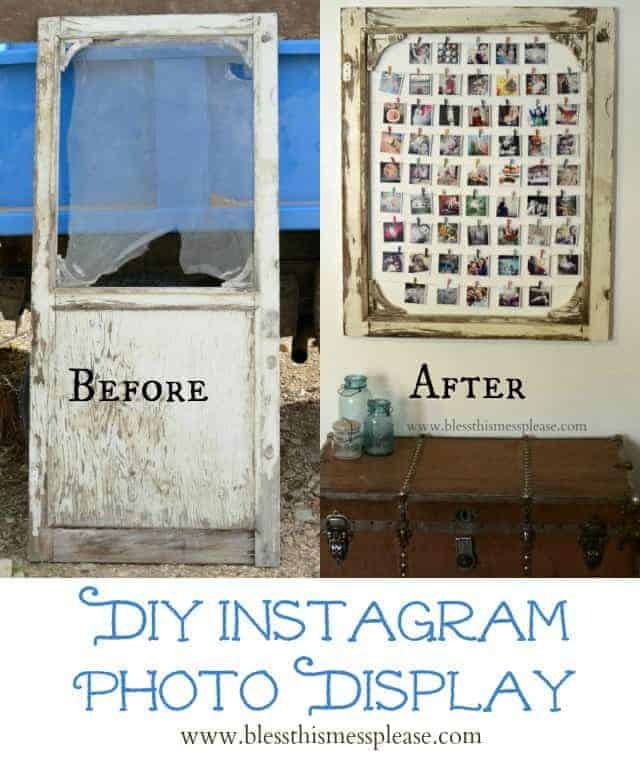 I made an instagram photo display out of an old wooden screen door that I found behind the house. FOUND! And the end result is gorgeous. And I’ll show you how to make one of your own too. No old wooden screen doors hanging around? 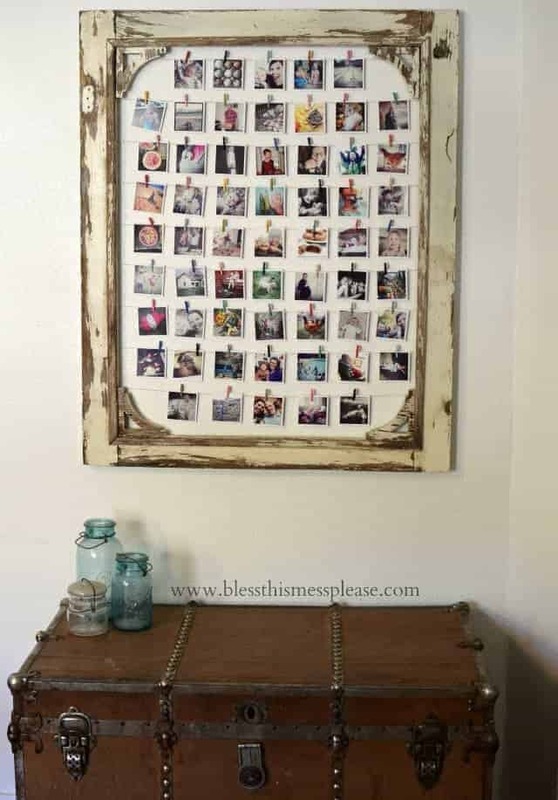 A big frame from the thrift store would work the same. I adore instagram (do you follow me?!). It’s such a fun way to document the every day. And what I love even more is having all of those memories printed and on my wall to enjoy. What’s the point in sharing all of those little moments with just the internet? Your family needs to be able to see them and relive them too! 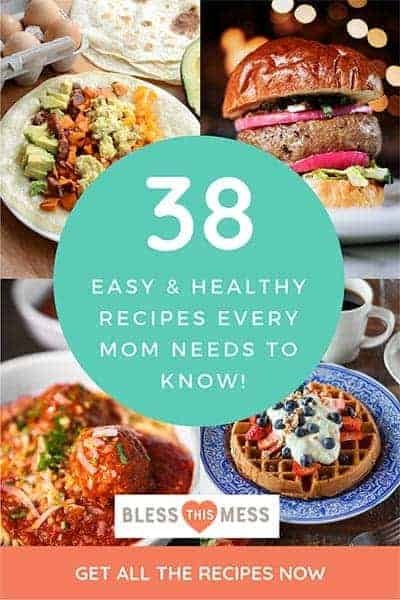 I also love things like my kitchen aid, my chickens, the huge first watermelon that we plucked from our garden last year, and the food that I make and photograph. Do I love them enough to have a full picture displayed in a frame in my house… no. 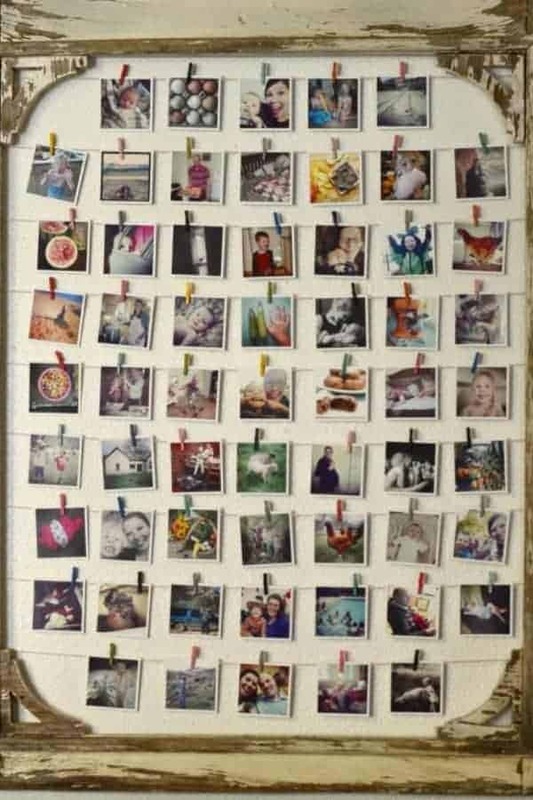 But I do love having a cute little 3×3 inch square of those treasures in my instagram collage! My kids spent hours standing on my trunk looking at the pictures, pointing at their favorites, saying “remember when!?!”. I smile every time I walk in the door and everyone that has come to visit has commented on how awesome it is. MAKE ONE! I’m tell you, you won’t regret it for a second. I ordered 3×3 inch instagram prints from Persnickety Prints. You just tell their site to connect to your instagram account and that is it! It pulled up all of my pictures, I chose a bunch to print, and they came super fast in the mail. I was pleased to see they are a Utah based company too. 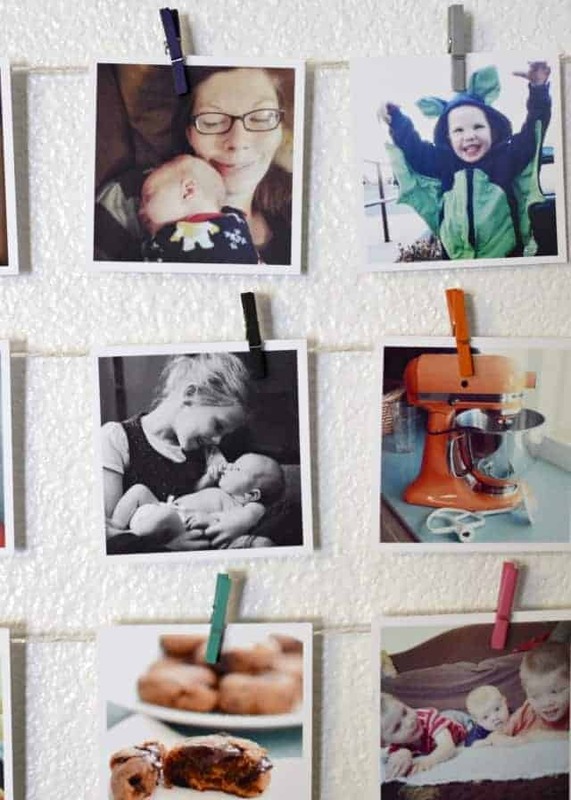 The pictures are printed on a card stock so they are just perfect for hanging up like this. They are sturdy and haven’t curled. I’d definitely use this company again for prints. 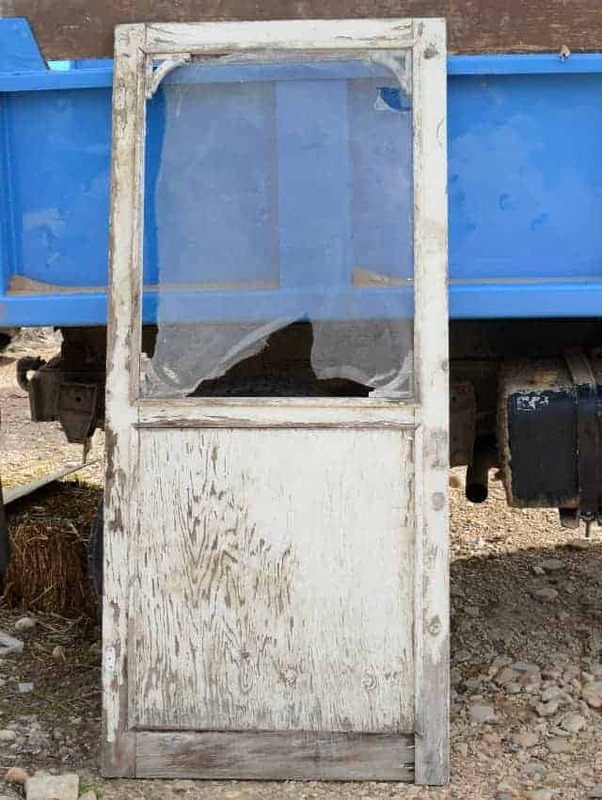 If using a screen door, cut off the bottom half using your saw. Owing power tools is the best thing ever. I recommend it. 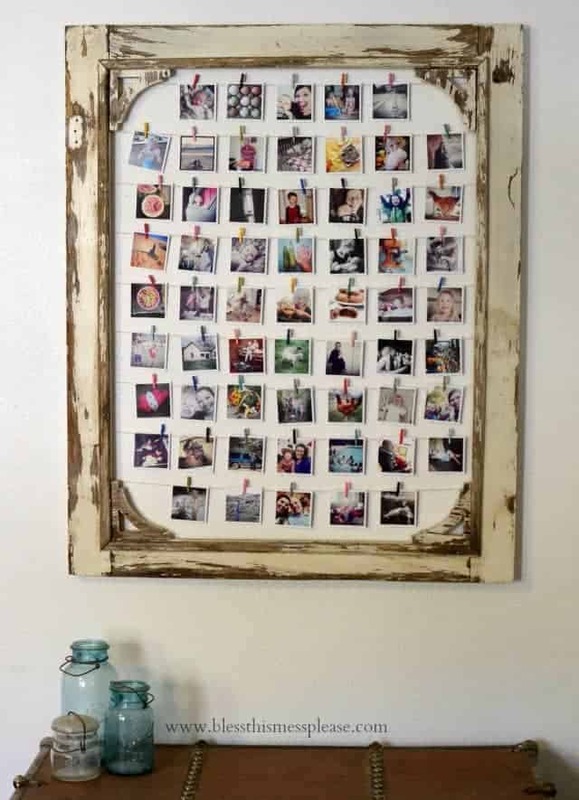 Paint, decorate, do what you like to your frame or door. My door was naturally weathered and really peeling. So I lightly sanded the door to get off any obvious flakes and then put on two coats of a matte finish clear top coat (comes in a spray paint can). I let it dry for a while outside and then I brought it in. I used baker’s twin to hang my pictures from. It’s small but has just the right amount of give to be pulled tight. I didn’t want my pictures drooping in the middle. Depending on the size of your frame/door opening and the size of your prints, mark the back of the frame where you want your string to go. I started 1 inch from the top and then marked ever 4 inches. It worked great. I cut the baker’s twine to be a few inches longer than needed and then I hot glued all of the twine pieces down one side of the frame (on the back). Let the glue cool and harden completely before moving on. 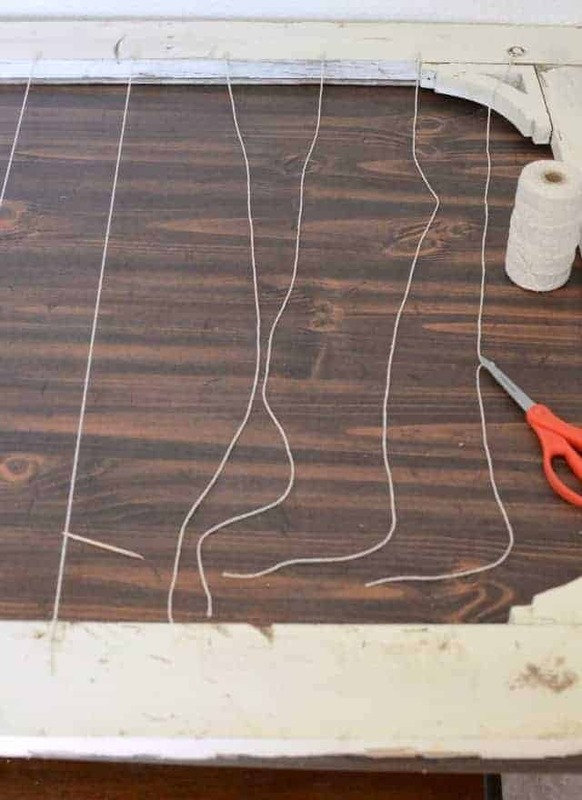 When one side of the glue has dried, pull the string over to the other side nice and tight. Glue the string to the back but continue to hold the end of the string taunt. Keep holding until the glue dries and the string no longer pulls back on itself. 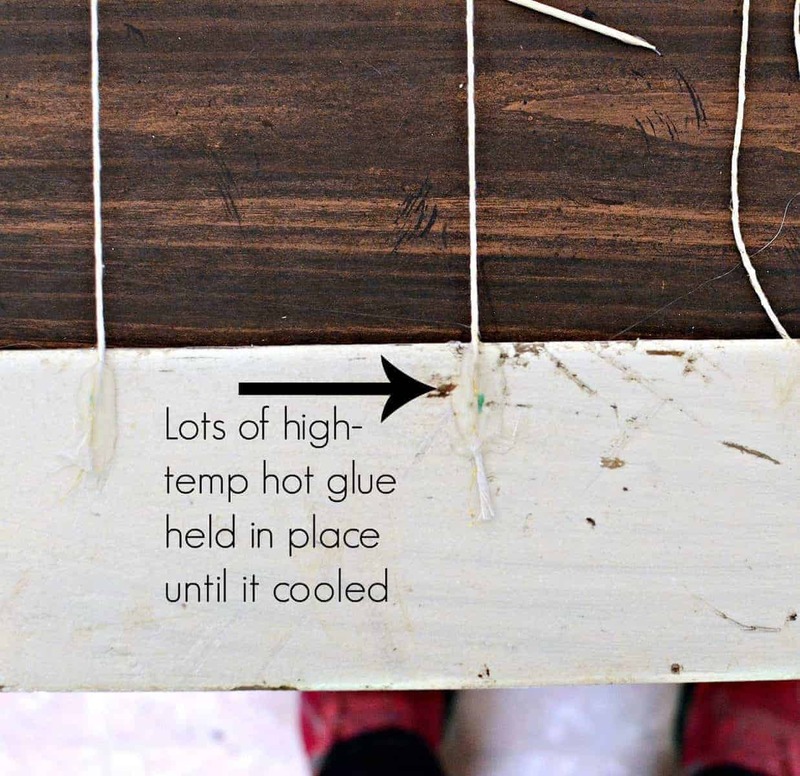 The high-temp hot glue is great for this because once it has cooled it is strong enough to hold the string tight with a little bit of tension behind it. Again, I wanted a nice tight string so that it wouldn’t sag with the weight of the pictures. I used two saw-tooth hangers on the back to hang it on the wall. 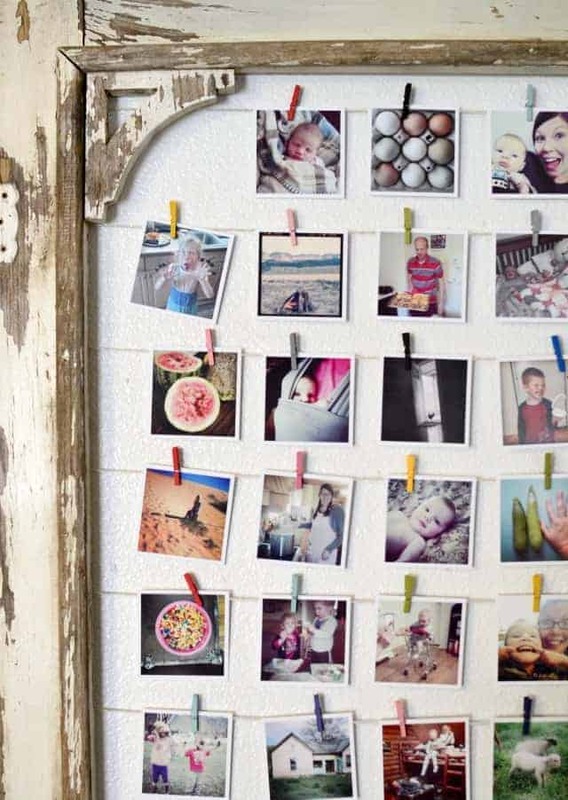 If you are using a picture frame these might already be on it. Then I used some tiny (1/2 inch long) clothes pins that I bought at Joann’s in the paper crafting section to hang my pictures from the string. That’s it! My friends over at Ryobi sent me a killer bag of power tools last April and I am still using them often and still really loving them. My husband wasn’t a huge fan of me borrowing his tools so having my own is awesome. Plus, projects like this are so much easier with a few power tools. So by all means friends, get those pictures off your camera and into your house where you can start enjoying them daily. What a great idea! 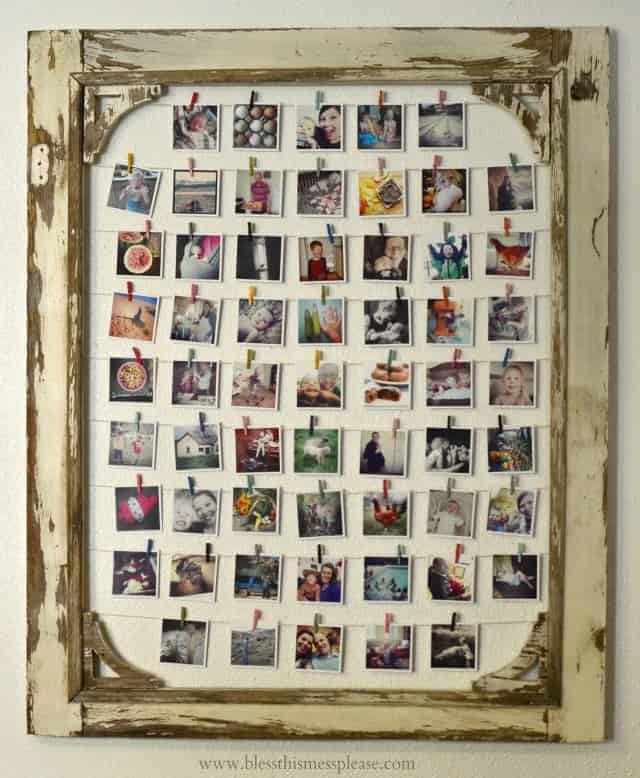 So cute with all your pictures in the frame. Love, love, love this! Way to be awesomely crafty, mama! I truly love this tutorial! 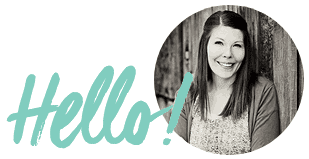 I shared a picture + your blog url on my blog, I hope you don’t mind. Thanks so much for sharing it, I’m in search of an old door now! !